Managers are the unsung heroes of organizations. There is no question that the highest performing organizations have effective managers in place. But what would be the best initiatives for you to take in your organization? Of the millions of articles and books that are available, what will give you the best insight? I am often asked this question, and in response have put together this list of the six key books that can guide an organization in improving its performance. 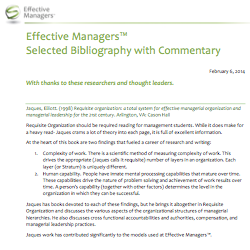 Thanks for your interest in our Effective ManagersTM Resources! Please provide your name and email to complete your free download. We will only use your email address to contact you about this material, and your contact information will never be divulged to another party. If you find this information helpful, please spread the word! If you have any questions or comments, please call or email Dwight.